André Suarès, French writer, critic, poet, and from 1912 onwards, one of the four "pillars" of Nouvelle Revue Francaise, once said: "Florence makes one believe in the certainty and sometimes even in the joy of intelligence." Pause for a moment, engage in some "critical" thinking, and roll that sentence around in your head. It is very worthwhile savoring the words. Would that we could utter such a phrase today. Florence, during the Middle Ages, was one of the richest cities in Europe, owing its success to a form of self-government. It was a city composed of bankers, wool and other merchants, and tradesmen. A merchant class had developed in Europe, and the origins of the modern banking system emerged in Italy in the 13th century. Florence became a center for great banking houses, which lent vast sums internationally. Florence also developed a thriving cloth industry, and with Genoa and Venice stood at the center of Europe's trading networks. New ways of life had became available to those who had been previously bound to the soil. Artisans became skilled in a multitude of crafts, and tradesmen carried all of this everywhere they traveled. Individualism slowly began to emerge, but was not to reach its fulfillment until the Renaissance in the beginning of the 15th century. This was to happen in Florence in the year 1401, with the competition for a set of doors for the Baptistry of the Cathedral of Florence. However, as mentioned previously, that's in our second semester. Additionally, a great many remains of Roman Florence (Firenze) were found underneath the medieval houses, including some thermal baths and a workshop for the dying of cloth. The presence of this type of production shows that long before the enormous development in the 12th and 13th centuries that brought so much wealth to the city and allowed it to finance all its civic, architectural, and artistic masterpieces, there was a thriving economy already in place. Now we have to clear the air on some things. Some sources say the Palazzo Vecchio belongs to the Italian Gothic Period, yet at the same time describe it as Medieval. It can, of course, be both, in that the Gothic period was part of the Middle Ages, sandwiched between the Romanesque and the Renaissance. But features which distinguish the Gothic, be it in France or Italy or any other country in Europe are architectural in nature: pointed arches, articulated ribs, walls at right angles to the building, verticality, a profusion of glass between supports, and a skeletal revelation of structure. The time frame is not as important as the elements of design in assigning a period. One look at the Palazzo Vecchio reveals semi-circular arches, solid massing, minimal window openings, strongly accented horizontality, machicolations and crenellations, and a watchtower, which further emphasizes the contrasting horizontal elements. These are all Medieval elements of design and construction. It is also appropriate to include the civic heart of Florence in this particular SESSION, which is presenting secular architecture. With that out of the way, we will proceed to tell you more about the building. Ah, but another digression. 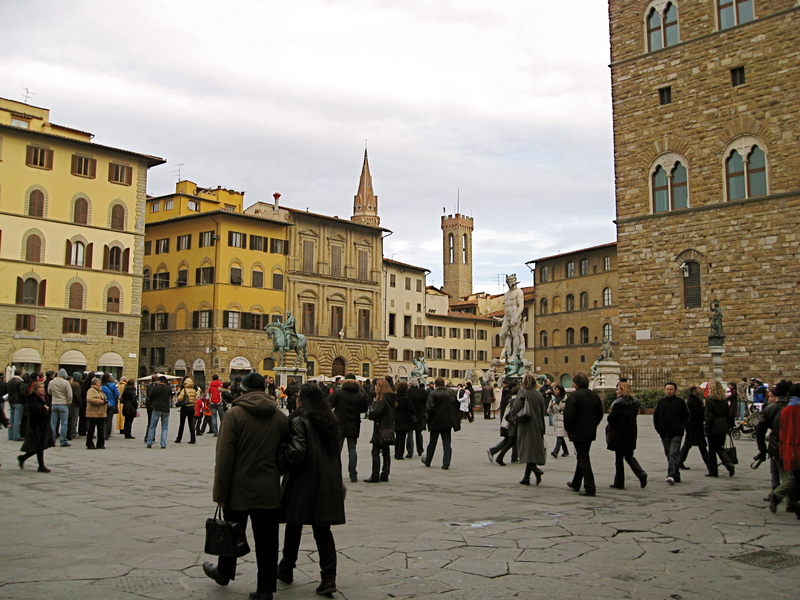 The Palazzo Vecchio sits at a corner intersection of an "L"-shaped piazza. Before we get to the main building situated in such an important place, let's talk about that piazza first. 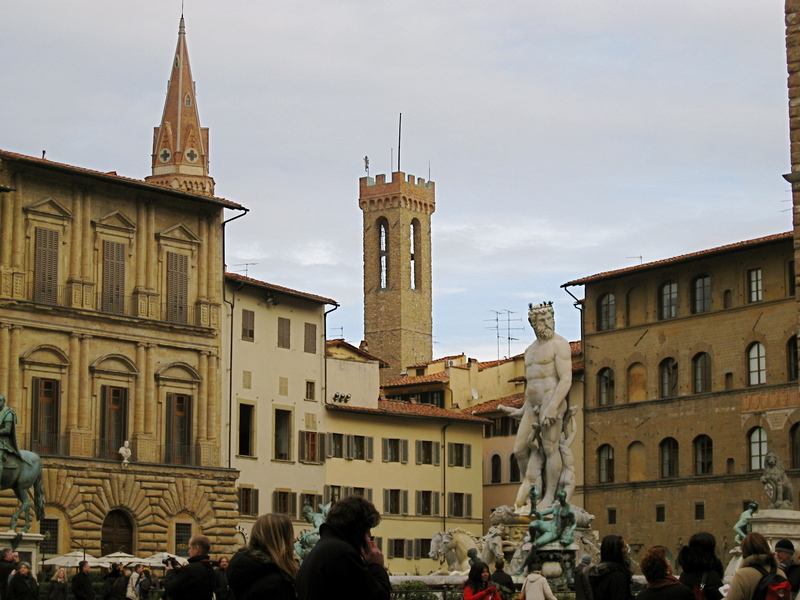 The Piazza della Signoria has been the political heart of the city from the Middle Ages to the present day. It is a major urban design that began taking shape from 1268 onwards. There's a convoluted history of pro-Papal forces (the Guelphs) fighting against pro-Imperial factors (the Ghibellines), who were vying for control of the Holy Roman Empire, with a lot of correlative activity happening in Germany and other parts of Italy. Florence was a leader among the city-states loyal to the Popes in Rome, and when the Guelph party gained control of the city again, they decided to obliterate the houses of their Ghibelline rivals. The first to be destroyed were the towers belonging to the Foraboschi and the Uberti families. This in spite of the fact that the head of the family (the famous Farinata celebrated by Dante in his "Comedy"), had defended the city from destruction after its army had been disastrously defeated at the battle of Montaperti (1260) by the Ghibelline coalition led by Siena (another city-state). Obviously no sense of loyalty here. I hope that without offending anyone, I can only say that this was like the mobs fighting it out for territory in New York and New Jersey. From Florence to Hackensack (figuring you have watched the Sopranos, so you'll understand) and from the Middle Ages to the 21st century - nothing changes. And, certainly, not just in Italy. We have only to look at the rest of Europe, battles over Poland, the Irish “troubles,” and most recently Yugoslavia with the resultant turmoil there. In the end, 36 houses were demolished in 1268, which explains the unusual "L" shape of the piazza and why the buildings around it are unaligned. What you see is all that remained after the city's enemies had all been "wiped out." Nothing was ever built on the site again. Weirdly, all of this hostility resulted in a magnificent urban space. The unusual shape allows different feelings of enclosure within one open space. The skyline is variegated, buildings step in and out of the piazza, and the architecture is rich in its diversity. Forgetting the "mob hits," concentrate on the resultant principles. As we said, the Piazza della Signoria has been the center of the city's life, and for 1,000 years, having been enlarged in the 13th century as noted above. Florentines rejoiced here in happy times, and gathered in moments of sorrow. Girolamo Savonarola, a man who fought corruption in his church, was burned at the stake for being a heretic. The year was 1498, the place: the Piazza della Signoria. Artists have been displaying their works in the piazza for centuries; festivals take place regularly, as well as wedding processions. The Medici family sponsored theatrical productions here, and apparently, what we in the States call "soccer" is periodically played in the piazza in 16th century costumes. The place is full of life but has a history of death. It is vital and alive, and that is what makes an urban area tick! The statues in the piazza deserve a SESSION all to themselves. 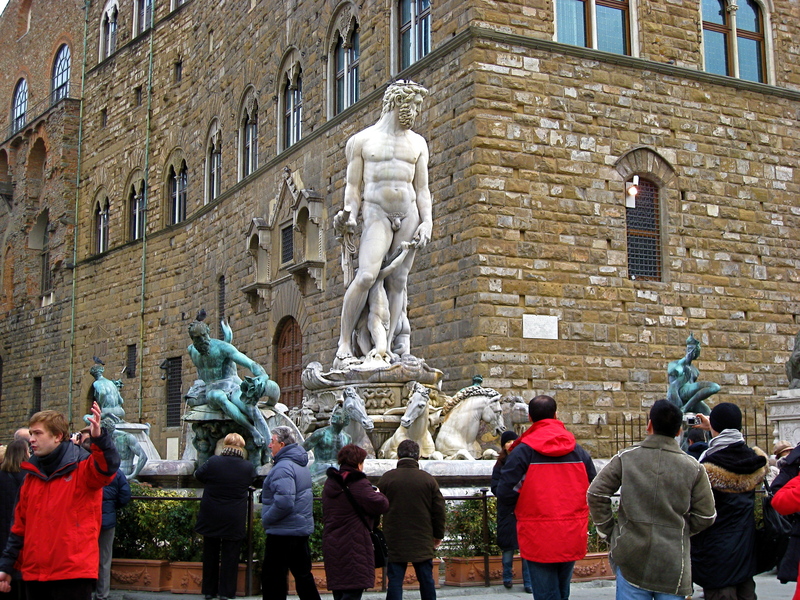 There are sculptures lined up in front of the facade of the Palazzo Vecchio, with the two smaller ones in scale to people, while the copy of David by Michelangelo and a companion piece are in scale to the piazza. We shall get to them shortly. The Fountain of Neptune by Ammannati sits strategically sited at the corner of the Palazzo Vecchio and the inside of the "L" shape. The equestrian statue of Cosimo I de Medici by Giambologna helps to psychologically separate the two angles of the piazza; it subliminally defines each space. See if you can spot that statue in our first illustration above. Nearby, a round marble plaque on the ground marks the exact site where Fra Girolamo Savonarola was burned at the stake on May 23rd 1498.